I find it fascinating that artists are so often expected to supply their skills for free. I have just received a mail offering an ‘opportunity’ for me to design a corporate logo. There’s a long list of expectations: high quality, clear design, visually strong in colour and monochrome etc. In short, all the things you would expect from a corporate client. The sting is at the end of the tail: ‘we have no budget for this work, but would welcome designs from artists looking to have their work published’. I’d like to say that this was an exceptionally cheeky effort, but sadly it’s all too common. We live in a society all too ready to ask if art is a ‘proper job’ while undermining our attempts to earn the money to make it so. I wonder why it is that the idea of ‘being published’ or ‘good for your CV’ is seen as a substitute for cash. I’ve tried it with my plumber and funnily enough he wouldn’t service the boiler on that basis. Perhaps artists are expected to live on the rarefied air of creativity alone, but I for one need filthy commerce to buy a ham sandwich now and again. It’s easy starting out to see any work of any kind as a fantastic opportunity and to go for this kind of job. The trick is to do the maths: if I’m not getting paid then I make it a rule that I get at least the value of my work and time back in concrete benefit and that doesn’t mean a vague promise about publishing or a line on my CV. I would urge you to do the same if you are in a dilemma about a freebie. You should bear in mind that being up front about the benefit to you with the client is good business practice and a decent client will respect you for it. It also helps all artists by helping to reinforce the fact that we’re not mugs and our skills have a market value. Leave the peanut payers to the monkeys with the poster paints. All my adult life I’ve been bad at taking a break. That’s a break to rest, not a break to do alternative work. I’m pretty good at displacement: I’m writing this very blog at the time when I should be checking everything is ready to open my doors for the last day of my Open Studio. I realise that I sound immensely smug, but I’d like to suggest that soldiering on is weakness on my part, not strength, and that a relentless attention to work is nothing to be proud about. Self employment as a creative is tough. In a world where there is no holiday pay, pension or sick pay, it is very easy to feel that most waking time should be spent either creating new work, doing paid work or seeking work. It’s easy to agree to taking on too much in case people suddenly decide to stop buying, learning or commissioning. Then there’s the personal need to move forward, experiment and develop which drives all artists (we are only as good as our last project after all). Add in the pressure of competition. I’m sure we’ve all had the ‘I stayed up all night to finish my project’ ‘All night? You were lucky! I worked 72 hours straight for mine’ conversation. Finally there is the subtle niggle of ‘what do artists do all day?’ (thanks for that snappy title BBC4) from those who just can’t see that putting ink on paper is really proper work. Frankly I’m not sure you even have time to read this blog. I think we artists often treat our skills and work with the same lack of appreciation that I gave to my lovely mum’s fabulous food. I’m sure there are hair-tossing superstars out there who are only too aware of their own genius, but most of us are all too ready to beat ourselves up about the details while missing the fact that we’re doing a really good job overall. A friend of mine asked me last weekend if I ever gave myself a pat on the back for my printmaking skills. I was genuinely floored by this and asked her if she ever told herself she was great at creating indigo textiles. Stupid question: of course we don’t; we’re too busy worrying over little technical hitches and glitches for that. This was also brought home to me by looking at some of Ian Philips’ lino prints with him. I love Ian’s work: it’s fluid and beautiful and a joy to see. He on the other hand was busily telling me that it wasn’t quite right and there was a slight registration error etc, etc. Now I should have seen all that, for sure I would have seen it had the print been mine, but I didn’t. Not a thing. 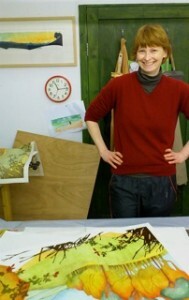 I was just blown away by the image and I’m an experienced printmaker working in lino. If I didn’t see the problems, who else will? So perhaps it’s time to give myself a break. I’ve just finished putting my exhibition up for my Open Studios over the next three weeks. I’ve worried and bothered and dusted and persuaded the big spiders to move under the plan chest for a while. I’ve dithered endlessly over which prints to show and which not. In the midst of all this angst perhaps I should also find time to remember that I’m being visited by members of the art loving public, friends and family and that they are not the printing Gestapo and will never see the prints with my hyper critical eye. It’s good to have high standards and I do pride myself on trying to do my best, but perhaps I should stop looking at the trees and enjoy the wood for a bit. I’d advise anyone else in the same boat to try it – perhaps we’ll even relax enough to cut ourselves some slack!